Today, I released the first development snapshot (3.25.2) of what will be GNOME Tweak Tool 3.26. Many of the panels have received UI updates. Here are a few highlights. Before this version, Tweak Tool didn’t report its own version number on its About dialog! Also, as far as I know, there was no visible place in the default GNOME install for you to see what version of GTK+ is on your system. Especially now that GNOME and GTK+ releases don’t share the same version numbers any more, I thought it was useful information to be in a tweak app. Rui Matos added a new Disable While Typing tweak to the Touchpad section. 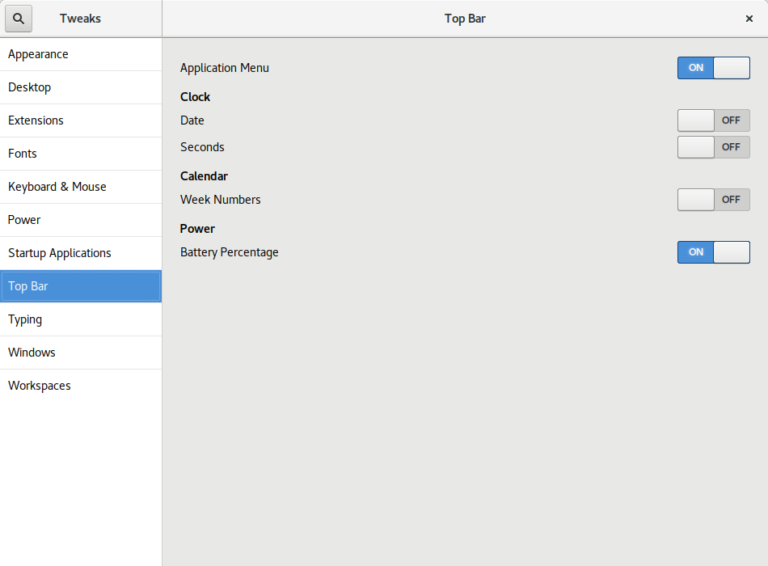 Alberto Fanjul added a Battery Percentage tweak for GNOME Shell’s top bar. I added a Left/Right Placement tweak for the window buttons (minimize, maximize, close) . This screenshot shows a minimize and close button on the left. I think it’s well known that Ubuntu’s window buttons have been on the left for years but GNOME has kept the window buttons on the right. 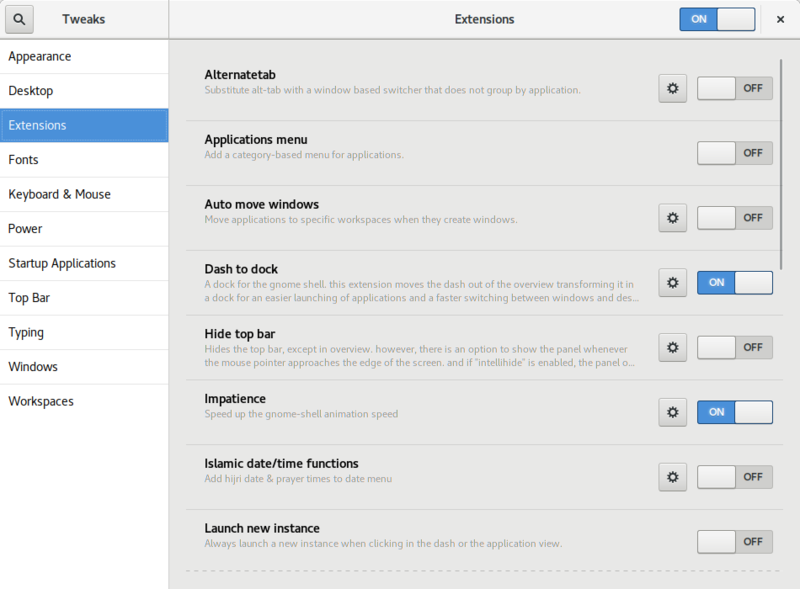 In fact, the GNOME 3 default is a single close button (see the other screenshots). For Unity (Ubuntu’s default UI from 2011 until this year), it made sense for the buttons to be on the left because of how Unity’s menu bar worked (the right side was used by the “indicator” system status menus). I don’t believe the Ubuntu Desktop team has decided yet which side the window buttons will be on or which buttons there will be. I’m ok with either side but I think I have a slight preference towards putting them on the right like Windows does. One reason I’m not too worried about the Ubuntu default is that it’s now very easy to switch them to the other side! If Ubuntu includes a dock like the excellent Dash to Dock in the default install, I think it makes sense for Ubuntu to add a minimize button by default. My admittedly unusual opinion is that there’s no need for a maximize button. 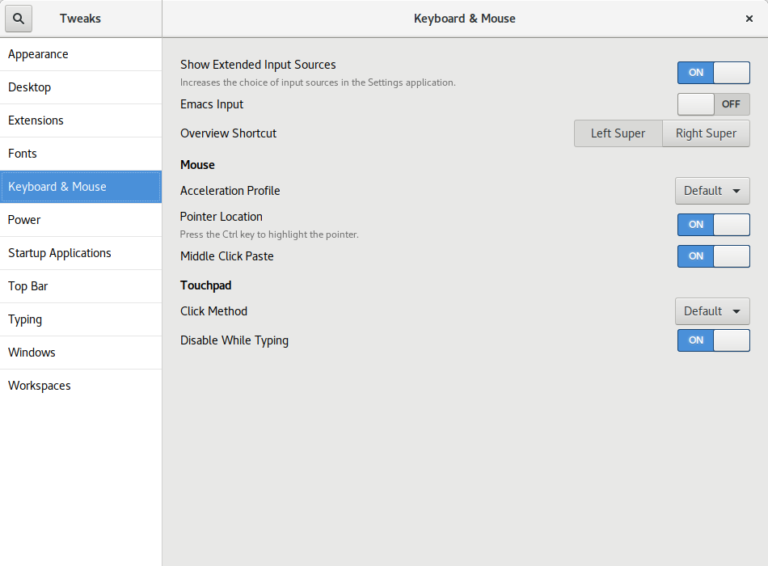 For one thing, GNOME is thoroughly tested with one window button; adding a second one shouldn’t be too big of a deal, but maybe adding a 3rd button might not work as well with the design of some apps. When I maximize an app, I either double-click the titlebar or drag the app to the top of the screen so a maximize button just isn’t needed. A dedicated maximize just doesn’t make as much sense when there is more than one possible maximization state. Besides traditional maximize, there is now left and right semi-maximize. There’s even a goal for GNOME 3.26 to support “quarter-tiling”. Ikey Doherty ported Tweak Tool from python2 to python3. Florian Müllner switched the build system to meson. For an app like Tweak Tool, meson makes the build faster and simpler for developers to maintain. 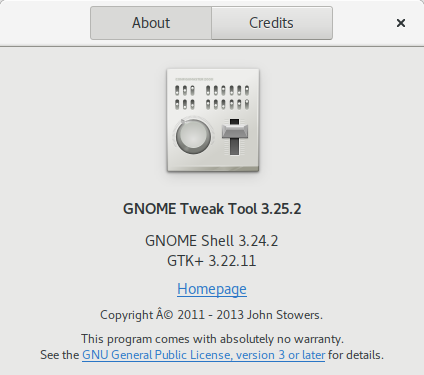 GNOME Tweak Tool 3.26 will be released alongside GNOME 3.26 in mid-September. Please does the ‘maximize vertically’ window action now work for all windows? from my testing it’s being ignored by windows with CSD. Yes, it works with many GNOME apps with headerbars. There are a few apps that are not maximizable though. Looks nice. But… Is it just me, or were “Remove” buttons removed from the extensions page? Yes, Install and Remove buttons were removed because it is recommended to install, remove and update GNOME Shell extensions from the GNOME Software app (which supports extensions since 3.22). Hmm, yes, it really does. I’ve forgotten about that. Some great stuff here! It’s great to see Tweak Tool back up to speed. A couple of tiny things that I’m sure you already know: seems like you still need to update the copyright info in the About. 😛 Though I don’t think notices that try to fully capture all the years and contributors really make sense for community projects… or at least, they end up being huge if they’re actually accurate! Also, there seems to be a problem rendering the copyright symbol. I think the © bug was triggered by switching to Python 3. Anyway, it’s fixed already for the next release. Thanks! An option to move the appmenu next to the hamburger icon would be very good. From my point of view it seems much more natural. That sort of exists now with the Application Menu switch turned off in the Top Bar section. It doesn’t work in some cases, but I’m happy to report that it is fixed in the next development snapshot, 3.25.3, next week. If you have the window buttons on the left, the appmenu will be to the right of the window buttons. If you have the buttons on the right, the appmenu will be to the left of the buttons. I’ll eventually do a post with screenshots about the feature to show you what I mean. Checkout the Unity styling for dash-to-dock 🙂 Ubuntu fans might like it. One thing that annoys me is that there is no refresh button on the appearance section. I usually install new themes, and I have to close and reopen the tweak tool each time I want to try a new one. Great job though! I love that I don’t have to go into dconf-editor to change the windows buttons to the left anymore! It would be great to be able to choose the level of transparency of the desktop panels from the application. I wish it were possible to change the legacy status icon bar from the lower left corner to the lower right corner. That would be a good option to be added in Tweak Tool. CJT, thank you for your feedback, but currently there is no GNOME Shell setting for that so there is nothing that can be done in Tweak Tool. GNOME Developers and Designers have been spending time this year thinking about how to better handle legacy status icons. Personally, I don’t use any apps that need them, although I do understand that they aren’t displayed very well right now. I’m missing the “Typing” menu in tweak tool, and previously reverted alt & win keys, now cannot get it back. Is this normal ? The follow-up to this post mentions that the Typing menu was moved to an Additional Layout Options button in the Keyboard & Mouse panel.